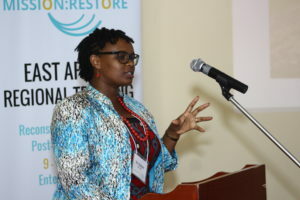 This marked the beginning of Mission: Restore’s 2018 East Africa Regional Training (EART) in Entebbe, Uganda. The week has been filled with engaging lectures and practical hands-on surgeries. For the first time since the inception of the EART, we integrated a 2 day Nursing Track. Throughout the EART, Mission: Restore and our partners collaborated to improve reconstructive surgery and preoperative skills for surgeons and nurses across East Africa. The first day of the EART focused on “Burns and Wound Management” with panels, lectures, and presentations from trainers, guests and our hosts at CoRSU Rehabilitation Hospital. The EART aims to provide all skills necessary to deliver effective care for patients. 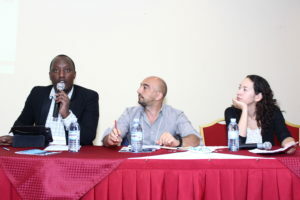 With that fundamental goal, day three of the EART focused on “Leadership, Management and Growth” starting with a panel including Dr. Christian from Partners in Health, Davide Naggi (CEO of CoRSU Hospital) and Dr. Joyce Aycock as moderator. Throughout the day, participants had the opportunity to present specific case presentations from their various hospitals. The final day of hands-on training in the OR, concluded the 2018 EART. And what an EART it was with over 100 participants from 11 different countries learning together through lectures, panels, networking opportunities and case presentations. All of this was made possible because of our partners: CoRSU Rehabilitation Hospital, LifeNet International, WiSA, and because of support from our sponsors: Smile Train, RealSelf, Allergan Foundation, Integra Foundation, and Sientra. We are grateful for their support and excited to work with partners and sponsors who share Mission: Restore’s drive to support surgeons and build surgical capacity that can make a lasting difference in people’s lives. Today may have marked the last day of the 2018 EART, but the week reaffirmed the journey we are on together. So, keep an eye out for EART 2019!